Please join us for this important exhibition. 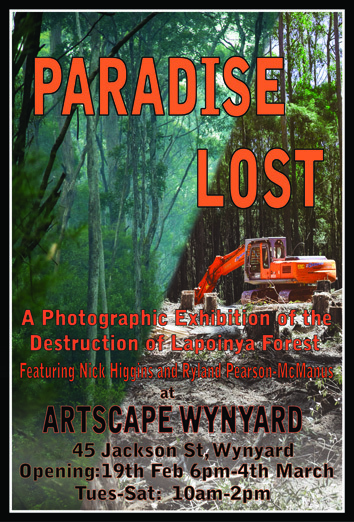 A photographic exhibition about the fight to save Lapoinya forest, entitled 'Paradise Lost'. To be held at Artscape 45 Jackson st, Wynyard. Then open till 5th March - Tues to Sat : 10am -2pm. Please come along. Members and friends of the gallery welcome. *February 26th 6pm - ArtsCape AGM - All positions open. New and old interested parties welcome. Memberships for 2016 will be due on the night (members only can vote). *6th March 10am - Working Bee at ArtsCape. Concentration on cleaning, garden and painting. Feel free to bring cutting from your garden. All hands welcome.